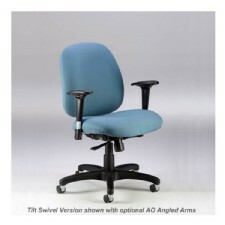 Sitwell's task chair series for everyday use, backed bya lifetime warranty. The Connect Series is one of the most customizeable series in the entire Sitwell line. For use with a variety of task positions and extended hours of usage. The Multifunction offers the most ergonomic controls for an infinite range of movement. Connect - SitWell's most versatile office seating line. Form, function and comfort are combined to create Connect. Offered in 3 seat sizes with 5 different mechanisms and 6 arm options to choose from. Create-A-Chair that is performance oriented, ergonomically correct for task, management, executives, conferencing and guests applications. Memory Foam wrapped multi-density foam make this the most comfortable chair in its price range. Also included, is a waterfall seat front, the best choice for your circulation over long periods of time. Comes standard with a Black Poly-Resin Spyder Base. Ratchet back height adjustments allow for easy and specifically targeted lumbar support. Options, options, options your choice of 3 arm pads, chrome and brushed aluminum bases, different cylinder heights, ballistic nylon backs, seat slider, and more. Available in over 200 fabrics in 2-5 days. Stools and complementary guest chairs complete the offering. Seat Ht: ................................ 17" - 20"
Weight Capacity ...................... 350 lbs.